One of Ansel Adams’ primary personal commitments was to share his energy and abilities in support of the things he believed in, most notably, photography and the environment. In the cause of both, Ansel and his wife, Virginia, selected six photographs of Yosemite and offered them for sale through her family business, Best’s Studio, in Yosemite National Park. The year was 1958. Ansel’s intent was to present photography as an affordable art and to showcase the environmental grandeur of Yosemite National Park. Never much a fan of the “curios” that were the staple of most Park concessioners at the time, he also wanted to offer visitors a quality memento of their time in Yosemite. The 8×10 prints would be made from the original negatives by an assistant under Ansel’s precise direction and be printed in sufficiently large batches to make them affordable. This collection, entitled the Yosemite Special Edition Photographs, proved immensely popular, and over the years, Ansel added more images to the set until the total was capped at 30 at the time of his passing in 1984. Today, Best’s Studio is known as the Ansel Adams Gallery, and continues as a family-run business. 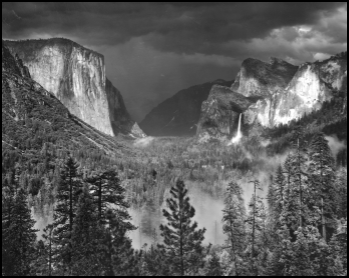 Ansel’s Special Edition Photographs of Yosemite are a mainstay of the Gallery’s offerings and heritage. Each print is still made by hand directly from Ansel’s original negatives, using his approach and methodology to ensure strict adherence to his standards and aesthetic. And while Ansel’s archives eventually became part of the permanent collection of the Center for Creative Photography at the University of Arizona at Tucson, he made special provisions for the Special Edition Photograph negatives to be held back from the archive so that the tradition of offering high-quality original art at affordable prices would continue as a personal legacy in support of the arts and the environment. To see the full selection of these affordable and authentic Ansel Adams prints, visit the Ansel Adams Gallery website. Alan Ross Photography would like to acknowledge the assistance and support of the Ansel Adams Gallery staff, Freestyle Photographic Supplies, and Print File.